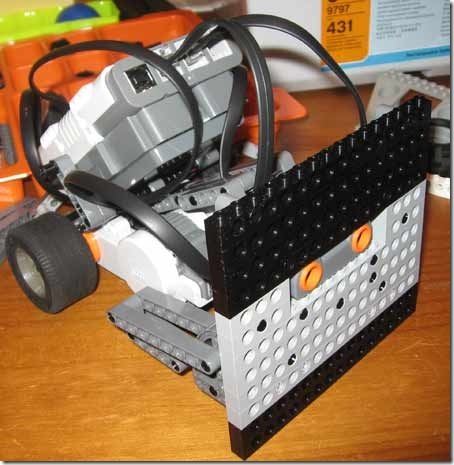 I’ve been taking spare time every few days to keep learning about the LEGO robotics. I figured since we’d talked a lot about the recent LEGO Sumo Building Competition (and maybe doing something similar locally – more on that soon). Pretty basic and simple (that was the plan) – from the motors back it is all stock Tribot from the book. The front is mostly “wall” and stuff holding the wall on/up. 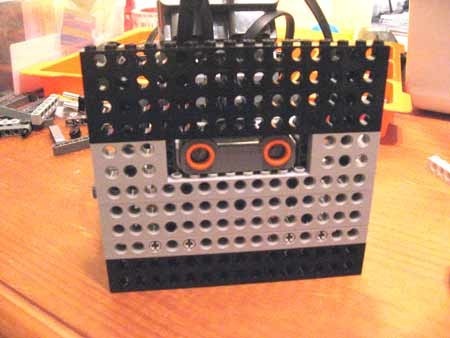 What the other robot(s) should see is just a wall of LEGOs coming towards it – the only thing other than wall is the distance/ultrasonic sensor peeking through to “look for” the other robots and go after them. 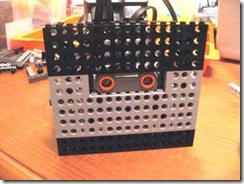 It is pretty solid and can push a robot of the same weight quite a ways. The only thing extra you really see by looking “under” is the light sensor which will look for the edge of the ring. You also see that the only thing holding the front on are four pins (two left, two right) so the front comes off in only a few seconds, which is nice to show people how it goes together and for maintenance. 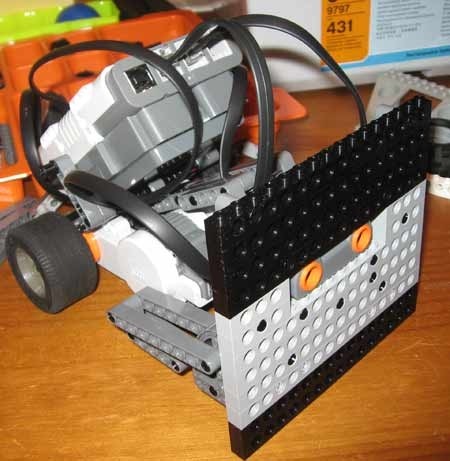 I’d need to build a Sumo ring (soon) and have a second bot to test with to really try it out – maybe I’ll get some video posted at that point? 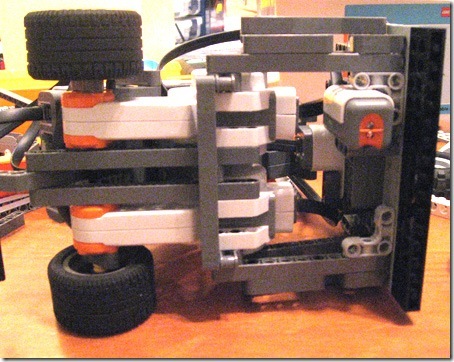 Observant folks will notice the one part that isn’t “stock” from the Lego NXT kit – the tires. I had some older racing tires that were more “slick” on the bottoms than the “knobby” tires that come with the kit. These have more grip on smooth surfaces and are soft rubber. I can easily switch back to all stock parts, but I wanted to see the difference in friction and power.